Macron’s call to ‘make our planet great again’ must start at home. France is continuing to invest aggressively in nuclear power at the cost of renewable energy, and recent commitments to limit the production of fossil fuels are less ambitious then they might appear. Since President Trump announced in June 2017 that the United States would withdraw from the Paris Agreement, French President Emmanuel Macron has been keen to highlight the importance of climate change on the international stage. His well-known catchphrase: “make our planet great again”, is modelled after Trump’s 2017 campaign slogan, and signalled to the world France’s commitment to robust action on climate change. As other EU member states like Germany and the UK have been caught up in domestic issues, France has carefully positioned itself as the climate leader of a divided union. But Macron’s commitment looks less certain in the context of France’s domestic policy. The country is continuing to invest aggressively in nuclear power at the cost of renewable energy, and recent commitments to limit the production of fossil fuels are less ambitious then they might appear. Whether Macron can pull-off his rhetoric on climate depends partly on how the country engages with China, the world’s largest carbon dioxide emitter, and biggest investor in renewable technologies. In an interview with china.org.cn ahead of his visit to China earlier this month, the French President underlined the importance of Sino-French cooperation in the fight against climate change. During the visit both leaders reaffirmed the shared commitment to contain global warming. In the joint statement released by Xinhua News Agency, they called for a united front against the global challenge of climate change, as well as improvements in global governance and stronger multilateralism in international affairs. Yet despite these commitments – and a speech in Mandarin that went viral – the visit failed to produce any substantial outcomes for the environment. Instead, it yielded some 50 commercial agreements signed between Macron and Xi aimed at addressing France’s ongoing trade imbalance with China. While UK Prime Minister Theresa May is busy with Brexit, and German Chancellor Angela Merkel is preoccupied with securing a strong coalition for her fourth consecutive term, France has moved to fill the leadership vacuum. This started with the announcement of the Global Pact for the Environment in 2017, a framework to help countries implement the Paris goals that draws all existing environmental laws into one document. 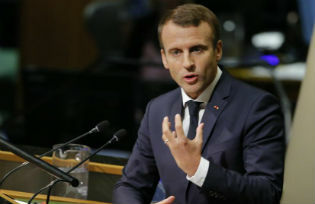 Then, at the United Nations General Assembly in September 2017, Macron declared France’s financial commitment to climate action and insisted that the Paris Agreement would not be renegotiated (referring to President Trump’s intention to withdraw the US). At the United Nations climate summit in November, France reninstated its intention to become carbon neutral by 2050. And at the One Planet Summit a month later, Macron gathered together world leaders and public and private representatives to discuss how to finance climate action. Beyond declarations, France is the fourth largest contributor to the Green Climate Fund. While the summit secured major financial commitments from organisations, such as the Gates Foundation, AXA and the World Bank, many of these had already been planned. The number of new announcements was disappointing. That said, China, Canada and the EU announced another ministerial climate summit, scheduled for June 2018 in Brussels. If France is trying to present itself as global leader on climate then at the domestic level the picture is more complicated. Macron’s Climate Plan calls for coordinated action between all government departments to accelerate France’s “ecological transition” and the implementation of the Paris Agreement. As the first concrete action, the Minister for the Ecological and Inclusive Transition, Nicolas Hulot, put forward a new law in September 2017 (adopted by the National Assembly in December). This will phase out the production of hydrocarbons on French soil by 2040. It makes France the first country to prohibit the exploration and exploitation of hydrocarbons on its soil. However, Greenpeace France has accused the government of limiting the law’s scope. Furthermore, only 1% France’s total fossil energy comes from domestic sources. The impact of the law will therefore be limited. France’s reliance on nuclear energy raises further questions. In a report published in April 2017, Réseau Action Climat France stated that nuclear power accounts for 16% of France’s energy supply, compared to 2% globally. Nuclear power is often seen as favourable to other forms of energy production on account of its low CO2 emissions. However, aside from the threat of nuclear incidents and their disastrous consequences, nuclear technology is increasingly thought of as ill-suited to a changing climate because it is also dependent on resources such as water. For example, the electricity produced from nuclear power stations requires more water than the electricity produced from photovoltaic or wind power sources. In order to reduce the country’s reliance on nuclear, the Hollande administration adopted the Energy Transition Law in 2015, which proposes to reduce the share of electricity derived from nuclear power to 50% by 2025 whilst improving energy efficiency and increasing the share of renewables. The Minister for the Ecological Transition has admitted that such a goal will be difficult to achieve. As France looks to bolster its international image on climate and the environment, its credibility will be increasingly linked to how effectively it manages its domestic transition towards a low-carbon economy. ​Ludovica Meacci is an intern at China Dialogue.